In just two years, 6DT Consulting grew from 3 to 88 clients. The firm, spearheaded by president and founder, Christiane Constantineau, and co-founder and COO, Jean-François Thibault, is built around cloud technology. 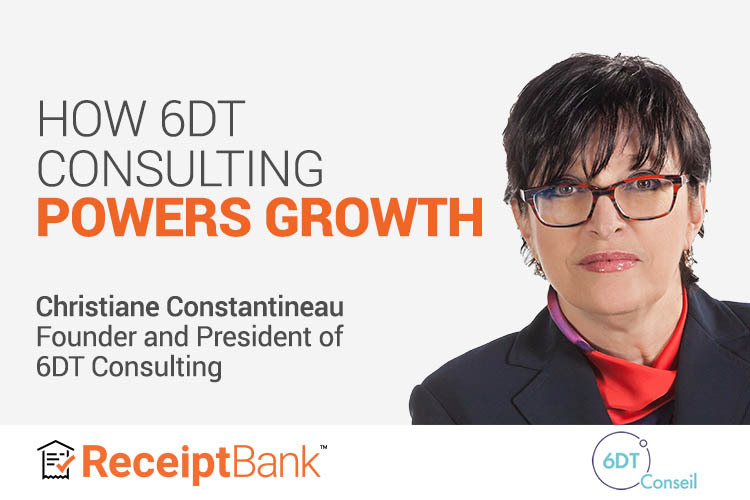 Here’s how Christiane and her team of four use the latest tools to offer an innovative virtual CFO service and bookkeeping firm, helping companies in Canada and overseas growth. Christiane has years of experience helping startups manage their cash-flow and restructure financial management. After starting her career in international development in Ottawa, then joining a Montreal-based investment capital firm, Christiane is a seasoned professional in financing and restructuring startups. “Clients trust us because of our expertise in corporate finance. For example, one of 6DT client in Quebec, that is selling industrial equipment, needed financing to back-up the purchase of a big piece of equipment (around $100 000 US dollars). They sought us for advice and we helped them by integrating FundThrough into their QuickBooks online ledger. FundThrough is a Toronto-based company, that help finance invoices. Now, this client can sale the equipment and their revenue has [subsequently] exploded. Recently, another client also needed budgets & forecasts to get a loan, and we helped them get it done in less than 72 hours by using Budgeto, an award-winning budget tool,” explains Christiane. 6DT Consulting offers bookkeeping alongside virtual CFO services. Christiane is a strong believer in the continuing importance of high-quality bookkeeping in the era of automation. Christiane also creates demonstration videos using Loom to send to her clients when new features are introduced. With Receipt Bank, Christiane’s clients no longer need to bring in shoeboxes of paperwork. While working remotely, Christiane employs tools to help manage her team’s work patterns and priorities. One such tool is the Client and Firm View, features available in Receipt Bank Optimize. Christiane attracts clients in three ways: first, QuickBooks Find An Accountant; second, word-of-mouth referral; and third, Receipt Bank. Christiane also saves time by applying the feature, Auto-Publish, to automatically publish items. Christiane’s goal for the firm is to have 300 monthly recurring clients by May 2020, and identifies a huge area for growth in startups in Canada. Christiane is also looking to launch a client hub, enabling clients to ask questions through a 6DT Consulting chatbot to scale her business. interested in becoming a receipt bank partner?